If you want to do something unusual and curious, this species is for you! Indeed, this naturally blind fish is a source of fascination. But beware, its maintenance in aquarium requires some precautions. Discover how to give the ideal coat to these strange fish! How to feed the Blind cave fish? Omnivorous: live prey or artificial food, with occasional planting (eg poached salad). What kind of behavior does the Blind cave fish have? Cavernous fish, which lives ideally in the dark. it searches the ground for food. it is sometimes found in the nature along with several hundred individuals. In the aquarium, opt for at least 8 congeners, but the more they will be numerous and the better they will feel. However, they will not form a shoal for their movement, but only for the taking of the meal. They are incredibly fast and catching them in the net is not easy. Who can live with the Blind cave fish? Sociable, it can live in a community bac. it will however be more comfortable in a specific tank due to the special living conditions it requires (temperature, decoration, very low light). Associate with it species with swimming rather fast. Sometimes, it may seem to you that the Blind Tetra attacks other fish during food distribution, but this is more due to its prey-seeking technique than to actual aggression. You can associate Danios to them, but avoid too calm fish like Scalars. 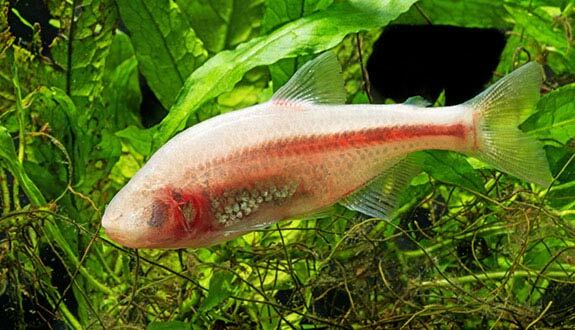 How to breed the Blind cave fish? The breeding of the Tetra blind is quite easy when one respects some primordial conditions. Place in a spawning tank (50/100L or 11/22 imp gal or 13/26 US gal) equipped with a protective grid, a male and a female. The temperature will be around 18/20°C (64/68°F). Introduce the couple in the evening, the spawn will be normally the next morning. If the eggs are visible, remove the parents after laying. If you still do not see eggs after 24 hours, remove the pair and try another pair. The laying can reach 1000 eggs. The incubation lasts between 18 to 24 hours. The fry have small eyes that will be covered with a layer of connective tissue as the fish grow. They must be fed infusoria, artemia nauplii and cyclops, or dried products of appropriate size. Which aquarium for the Blind cave fish? 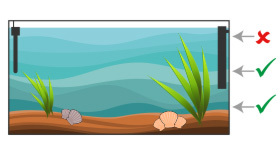 Its ideal aquarium is specific. It consists of sand (if possible dark), pebbles and rock, without plants. The water is quite cold (20°C (68°F)). 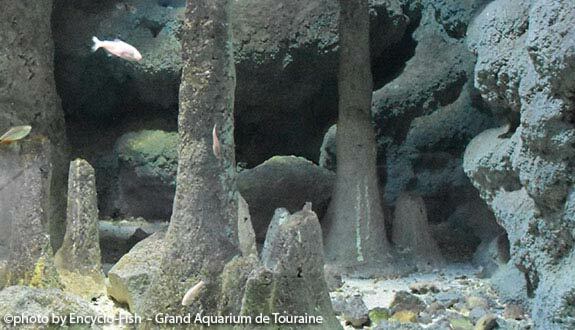 You can build your aquarium like a cave, which will remind it of its natural habitat. For example, placing large rocks or slate plates at the bottom and sides. Decorate the center with smaller rocks leaving free swimming spaces near the sand. Prefer soft lighting (it seems that neon red or blue are particularly effective). The current should obviously be weak. It is one of the largest species of Tetra. The beginners can maintain this species without much difficulty, it is quite robust. They are completely blind, but their sense of smell and touch are particularly developed. It moves and feeds thanks to its lateral line (sensory organ located along the flanks and allowing to perceive the vibrations of the water). Interestingly, it increases its swimming speed in a new environment containing objects it does not recognize. It increases the stimulation of the lateral line, allowing it to absorb information more quickly. We now know that the fish actually produces a detailed spatial map of its environment that it memorizes fairly quickly. It is often mistaken for Astyanax jordani, who looks like it in every way but has normal eyes. This species remains less popular than the blind form.